I’m excited to journey to Kansas City, MO next week to join the Mid-America Regional Council (MARC) and local partners in discussing how the Kansas City region can ensure that its many diverse and remarkable communities remains places where people of all ages (and income levels) can thrive. I’ve written over the years about some of the impressive work MARC is doing to expand transportation accessibility, mobility options and promote sound investments that meet community-identified goals. The Innovative MPO, written by MZ Strategies for Transportation for America, spotlighted the programs MARC launched to foster local implementation of regional goals and visions. Over the years MARC has done an exceptional job in supporting a diversity of communities across the region adopt and implement local complete streets policies that provide safer mobility choices for people of all ages, and those travelling in all modes. MARC’s comprehensive approach to Complete Streets supports local jurisdictions in their work to update policies, zoning and street standards, funds demonstration projects and incorporates complete street principles into regional planning and project selection. The process began in 2008, when the MARC Board of Directors adopted a regional vision document that emphasized sustainability. This served as the foundation for the region's next long-range transportation plan update, Transportation Outlook 2040, approved in 2010. The plan recommended adoption of a regional Complete Streets policy and included strategies to support implementation throughout the region. Months after the adoption of Transportation Outlook 2040, the City Council of Kansas City, MO — the region’s core jurisdiction — adopted a Livable Streets Resolution consistent with the regional guidance. For more details on MARC’s work download The Innovative MPO or check out the agency’s Complete Streets webpage. MARC has also been spotlighted by AARP and other national groups for its work to support “Communities for All Ages.” Like many regions, Kansas City’s population is aging and demographics are changing. Its older population is projected to more than double from 180,000 in 2007 to almost 372,000 by 2030. MARC has jurisdiction over regional transportation and aging services which makes it well suited to help think about what these changes will mean to transportation systems and services in the coming years. KC Communities for All Ages was formed by MARC in 2008 to coordinate a community response to the future needs of the aging baby boomer generation. The Initiative focuses on five major areas: housing, transportation and mobility, social and civic engagement, caregiving, and health. Through MARC’s KC Communities for All Ages work, I’ve been invited to join with local practitioners, developers and other regional stakeholders on November 30th to discuss opportunities for creating more transit-supportive, walkable communities through transit-oriented development. 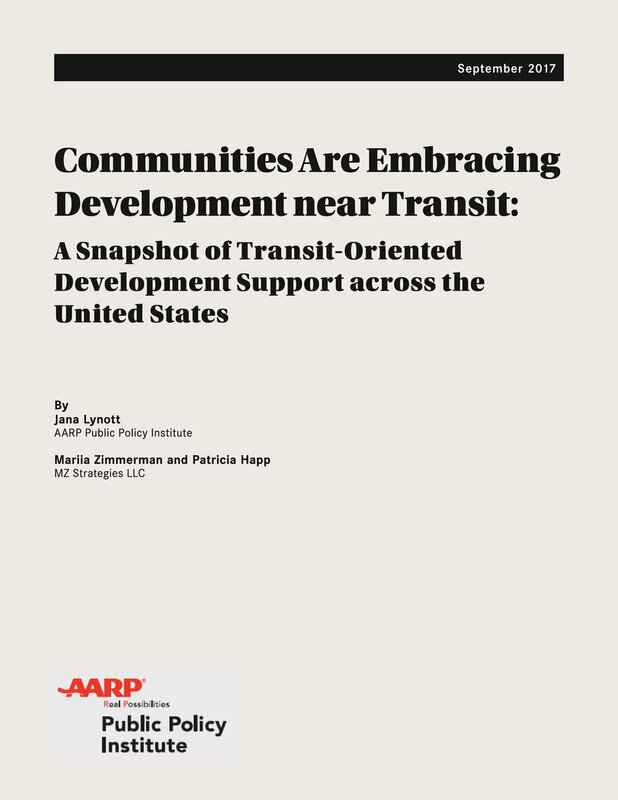 I will be sharing findings from the recent AARP Public Policy Institute report“Communities are Embracing Development near Transit: A Snapshot of Transit-Oriented Development Support across the United States,” which MZ Strategies co-authored with AARP’s Jana Lynott of the AARP Public Policy Institute. The November 30th Transit-Oriented for All Ages workshop will talk through these issues and explore Kansas City’ emerging vision for transit that builds upon the initial success of its restored streetcar, plans for expansion and its existing regional transit system. The Transit part of TOD is essential, but transit alone does not ensure success. Ensuring that local zoning and building codes are aligned to provide greater housing diversity, a mix of uses to provide accessible retail, health, education and commercial services, and greater density that can support transit ridership are all equally important ingredients and make up the -OD part of TOD. As the new AARP report shows, more cities, regional agencies and states are stepping up to provide financial, planning, and regulatory support for transit-oriented development. Our analysis uncovered over 100 different state, regional and local TOD interventions. At the state level, funding and financial supports are a major way that state legislatures and agencies are engaging. Of the 47 regions we analyzed, 82% are supporting TOD often through local policy and planning supports of which MARC’s Sustainable Places program and its KC Communities for All Ages Initiative illustrate. It’s always great to visit new communities like Kansas City and learn how different places are approaching the work of equitable development and universal design. It’s also great to revisit those regions I’ve had a chance to work in over the years. 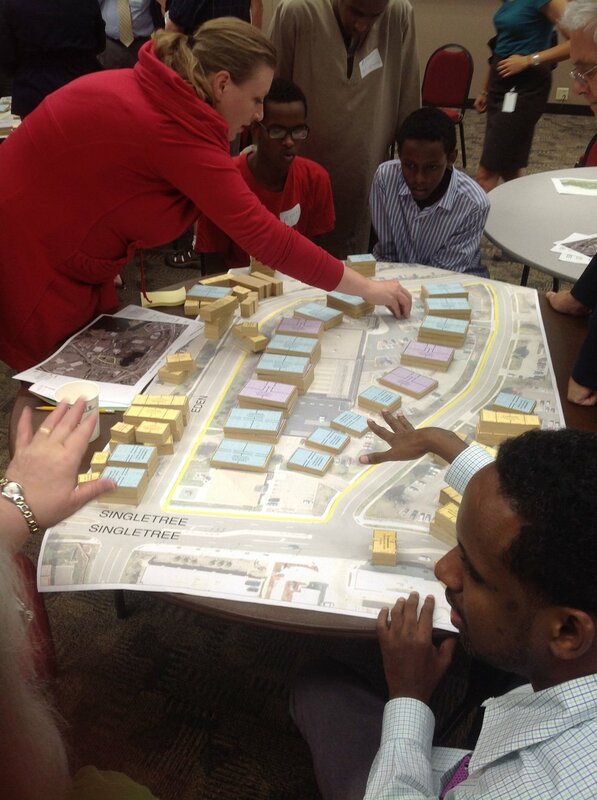 In the coming year, MZ Strategies looks forward to again supporting local partners in the Minneapolis and Saint Paul region to assess the strengths and gaps in its equitable TOD evolution. Transit ridership grows on its two main light rail corridors and new development along LRT exceeds expectations. At the same time, though, the region struggles to attract and retain workers, is facing rising housing prices and evictions, faces deep racial and economic inequities between neighborhoods, and is challenged to get workers to jobs especially in lower-skill jobs that have moved to outer ring suburbs where transit service is a challenge. But the region is blessed with many assets including strong local advocacy, affordable housing and workforce development partners, an engaged business community, and elected leadership that hopefully continues to play a critical role in shaping their region’s future to be more equitable, sustainable and economically thriving. It's that time of year to give thanks, and MZ Strategies is incredibly appreciative of our many partners in this complex work of creating thriving, inclusive communities! It’s also a time of year when we are encouraged to give back. As I’ve written before, those of us who make a living as planners, architects, engineers, developers, transportation professionals, etc …. must recognize that our work is only made possible because of local advocacy organizations and non-profit groups who carry so much of the water involved with creating inclusive communities for all ages. The best way we can support our values, our mission and our longevity in this work is to support financially these non-profit partners who -- with limited resources -- do amazing things!